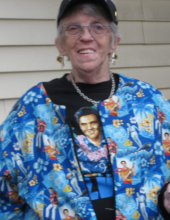 Kay M. Froehlich Selbach, age 72 of Town of Pacific, died peacefully at home on Sunday, January 13, 2019. Kay will be sadly missed and mourned by her son, Tod Froehlich of rural Pardeeville; her sister, Sandra (David) McMahon of rural Lyndon Station; one nephew, Patrick McMahon of Minneapolis; a brother-in-law, Alex Finkenstein of Clermont, FL; many other relatives and friends. Kay was preceded in death by her parents, Loren and Marjorie (Lindert) Froehlich; her husband Gus Selbach and one sister, Joyce Finkenstein. As per Kay’s wishes, no services will be held. The Kratz-Smedema Funeral Home in Cambria is assisting the family. To leave online condolences please visit www.kratzfh.com. To send flowers or a remembrance gift to the family of Kay M Froehlich Selbach, please visit our Tribute Store. "Email Address" would like to share the life celebration of Kay M Froehlich Selbach. Click on the "link" to go to share a favorite memory or leave a condolence message for the family.